It’s the last day of June, the end of #BlogJune for this year. It’s been a challenge to keep up with a post every day, and we haven’t (as originally intended) managed to complete a farm or house task every day, but it’s been fun anyway. Today’s task has been using some of the kumquats I picked on the weekend, making most of them into candied kumquats, and some (along with some limes) into lime-and-kumquat-jelly (not marmalade, as I’ve sieved all but a few decorative strips of zest out of the jam, but basically lime marmalade flavoured – hopefully it sets). There are jars and bottles on the counter, cooling. I’ve also made a giant batch of vegetarian Boston Baked Beans, for a dinner party I’m attending this weekend. The whole house smells delightfully of spices, savoury beans, and citrus. However, that is nto the topic of today’s post. Today I wanted to talk about bees again, and specifically about feeding your bees. Bees consume pollen and nectar from flowering plants; the nectar gives them carbohydrates in the form of sugars, as well as minerals and essential vitamins, and the pollen provides them with protein. Most flowering plants produce nectar, and all produce pollen, but not all of these plants are useful for honeybees searching for food. On top of that, not all flower across the entire year, so if you want to keep your local bees fed it’s important to plant a variety of good bee fodder plants. Bee plants include all sorts of flowers, from groundcovers and herbs to shrubs and trees, so no matter what type of garden you have you’ll be able to plant something for the bees. Here’s a list of some good ones for Perth. We plan to plant (or have already planted) most of these. Casuarina: She-oaks (Casuarina and Allocasuarina species) are evergreen shrubs and trees, with the largest growing up to 35 m in height. They’re noted for the long, segmented branchlets they have which function as leaves. The branchlets (called cladodes) resemble conifer needles, even though she-oaks are flowering plants. The actual leaves are reduced to minute scales encircling each joint of the cladodes. Some she-oaks form symbiotic relationships with nitrogen-fixing soil bacteria, similar to legumes, so they’re a good plant to grow in poor soils. She-oaks don’t provide a lot of nectar, but they are a good pollen source, and as such are very important to bees, especially in spring when beehives are increasing their population. Herbs: Basically all our culinary herbs are also great for bees, and most produce large quantities of both nectar and pollen. The best herbs for bees include thyme (Thymus spp. ), oregano (Oreganum vulgare), and any type of sage (Salvia spp.) or mint (Mentha spp.). Borage (Borago officinalis) is also a good one, with beautiful little blue flowers which are very attractive to bees, and the leaves can be used in salads or cocktails for their cucumber-ish flavour. Citrus: All citrus trees produce large quantities of fragrant nectar, which is why they are usually covered in honeybees when they flower. Any citrus tree you plant will be good for honeybees; if you’re not keen on loads of oranges, mandarins or grapefruit, try a lemon or lime tree, or a kumquat or calamondin. Citrus honey is pale in colour and mild flavoured, and is very highly regarded. Lavender (Lavandula spp. ): Lavender is a small, fragrant shrub which is highly attractive to bees (and the flowers and leaves can be used in human food too, as a flavouring). Lavender honey can be white to amber in colour and has an intense floral aroma. Lavender can be pruned into a formal box hedge, or left to itself to grow a slightly more uneven shape (which would fit in with a dune-vegetation or cottage style garden). Although it isn’t native, it can be grown with Australian natives and won’t look out of place, with its grey-green foliage. Rosemary (Rosmarinus officinalis): Another fragrant, small shrub, rosemary is a magnet for honeybees – and the savoury flavour of the leaves mean its good for cooking with as well. Rosemary honestly grows like a weed in Perth – it will survive with little to no care, and if you occasionally water it or prune it a bit (for some leaves and sprigs to cook with), it will reward you with a mass of growth and lovely blue (or, depending on the variety, pink, lavender, or white) flowers. Rosemary honey has a slight herbal fragrance and flavour, and goes well with savoury as well as sweet dishes. Grey Box (Eucalyptus microcarpa): Most Eucalyptus species are useful for nectar, but some produce better honey than others. Grey box is one of the best, flowering regularly and producing a richly flavoured honey with malt or caramel tones. It is a slow-growing tree, normally up to 25m in height (sometimes taller), native to south-eastern Australia. The flowers are white and appear from summer to winter. This is a very important honey plant in Victoria, less so in South Australia, New South Wales, and Queensland; it is of minor significance in Western Australia, but will grow here quite happily. Guava (Psidium guajava): A favourite with honeybees, the guava tree’s flowers provide high quantities of both nectar and pollen. Guava honey is runny, and has a mild, pleasant flavour. Guava is a genus of about 100 species of tropical shrubs and small trees. The leaves are opposite, simple, elliptic to ovate, 5-15 cm long. The flowers are white, with five petals and numerous stamens. The fruit is round to pear-shaped, from 3-10 cm in diameter, with a thin rind which may be pale green, yellow, or pink to red, depending on species. The flesh of the fruit is sweet, white or pink-orange in colour with many small hard seeds, and a strong, characteristic aroma. Wattles (Acacia spp. ): Most wattles produce masses of pollen and nectar when they flower, and are frequented by any honeybees in their vicinity. Acacia species (both African acacias and Australian wattles) range in size from shrubs through small trees to a few canopy trees in some regions. The flowers are arranged in inflorescences that may be either globular heads or cylindrical spikes. Each inflorescence may comprise three or more individual flowers, up to 130 or more. Acacia species flower throughout the year although most flower during spring and summer rather than during autumn and winter. Roses (Rosa spp. ): The humble (or not so humble) rose flowers throughout spring and summer, especially if properly cared for and pruned, and provide a rich source of pollen and some nectar. There are over 100 species of rose, and thousands of cultivars and varieties. They include rambling groundcovers, climbers, and woody shrubs, with flowers ranging from pinks and purples through to reds, oranges, yellows, and white. Many garden roses, in spite of their association with English gardens, are actually very hardy once established, and thrive in Perth’s hot, dry climate and sandy soils. Banana plants (Musa spp. ): You didn’t realise that banana plants were a great food source for honeybees as well as humans, did you? They provide large quantities of nectar and pollen, and grow quickly to flowering stage. I don’t have any information on the honey produced, only that it is produced in large quantities and that beehives kept in banana plantations tend to be healthy and well fed. Bottlebrush (Callistemon spp. ): I’ve never seen a bottlebrush shrub or tree flowering that didn’t have honeybees gathered on the flowers. They love it. Bottlebrushes range from small shrubs to small trees, and their flowers range from white or pale yellow through pink to dark red. They produce a mild flavoured, smooth tasting honey. Passionfruit (Passiflora edulis): A climbing perennial, passionfruit – or, more accurately, the passionflowers – produce large quantities of both pollen and nectar for honeybees. Passionfruit is a beautiful vine, and will easily give you a green wall if you give it something to climb on. It is evergreen, and flowers twice a year in Perth. The fruit may be yellow or purple on the outside when ripe, with a dark yellow, deliciously sweet-sour pulp and many black seeds inside. This list is far from complete – there are many, many flowering plants which make great food sources for honeybees. Almost all herbs, vegetables, and heirloom variety garden flowers are perfect nectar sources, as are most fruit trees. Apple trees, and stone fruit are very well regarded as bee fodder plants. Old fashioned cottage garden flowers like alyssum, honeysuckle, sunflowers, and daisies of all sorts attract and feed bees, as do many flowering bulbs (daffodils, lily of the valley, ..). Many of the modern ‘potted colour’ flowers that you can buy at nurseries don’t produce much nectar or pollen, putting all their energy into showy flowers instead; flowering trees or shrubs, or heirloom variety vegetables or garden flowers are a better choice. So, to make a long story short, if you want to help the bees, but you don’t want to keep a hive yourself, the most useful thing you can do is plant some flowers. 🙂 Go forth and garden. Why host a beehive? Well, it’s more a case of why wouldn’t you, really. It’s easy and safe, the bees will pollinate all your vegetables and your fruit trees, and produce honey as well. Plus, honeybees are under a lot of pressure from climate change, pollution, disease and the use of damaging pesticides such as neonicotinoids – so hosting a hive will help make sure there are healthy honeybee populations around. All you need a little space – as little as 2 to 4 sqm that don’t get walked through every day, in a corner of the garden or even on your roof or the roof of your garden shed – and a bird bath or pond to provide water for the bees. You do need to provide water, otherwise the thirsty bees will go for the nearest water source, which might be your (or your neighbour’s) swimming pool, or your dog’s water dish. That’s when bees become a nuisance. You can reduce the possibility of your bees being a problem for people by putting a person-height barrier (a shade cloth screen, for example, or a hedge) in front of the hive so that the bees have to fly over it to leave; they will then tend to stay at that height until they get to the flowers they are heading for. You should also check on your local council’s rules – most councils allow beehives, but some have rules about how far from the street your hive must be, or how many hives you can have. You also need to register with the state government for a ‘hive brand’, and pay a registration fee, so that you can legally keep bees. The hive brand is a symbol or combination of letters and numbers which must be visibly marked on your hives. You should open your hive up to check on the bees at least four times a year (once per season), to make sure they’re healthy and don’t have parasites or diseases. Open the hive in the morning, ideally on a sunny day – never in the rain or late in the evening. Bees become defensive and angry if disturbed at night. Smoke your bees gently before opening the hive, using a bee smoker. You can also harvest honey when you open the hive up – we’d suggest doing an intro to beekeeping course to see how it’s done before trying it yourself. Always listen to your hive – you can hear their mood in the tone of the buzzing. Beekeeping equipment for maintaining your hive and harvesting honey is available from several suppliers, who can also advise on where to buy bees – try Perth Bee Supplies or Guilefoyles, or you can buy the equipment online from multiple sellers. Your first beekeeping supplies, other than a hive, should include a bee brush, a smoker, an implement called a hive tool, and protective gear (bee suit, gloves, veil). Once you have the honey, you still have to use it. Honey tastes sweeter than sugar, so you need less of it in most recipes. Use approx. ½ to ¾ cup of honey per cup of sugar replaced – and be aware that some recipes won’t turn out the same, especially confectionary, because honey contains different types of sugars to regular sugar (fructose and glucose, rather than sucrose). Honey also adds liquid to a recipe, so you need to reduce the liquid content of the recipe from other sources. Reduce the liquid content of a recipe (from water, milk, etc.) by about ¼ cup for every cup of honey you add to the recipe. Honey is great to bake with, and works really well in jams too. Spoon into cupcake cases or muffin pans. Bake at 180 degrees C for about 10 minutes, or until golden on top and cooked all the way through. On Saturday I’ll be presenting at the 2016 Less is More festival in Peppermint Grove. I gave a presentation last year, on urban livestock, and I really enjoyed the experience. I’ve signed up to present again this year, this time on beekeeping. I’m no expert bee-keeper, but I do have bees and I love them. They’re fascinating, and very low maintenance, and they produce amazing honey from the flowers around here. My first introduction to bees as anything other than a flying insect in my garden was in Melbourne a few years ago. I did a one day “intro to beekeeping” course at Ceres, which is Melbourne’s equivalent to City Farm. I’ve always loved honey, and after that course I was hooked on the idea that I could keep bees for myself, to produce honey and to help the environment. One of the best things about having bees around is the honey the produce (although the pollination services they provide are also very important! ), and the things you can do with it. Honey isn’t just for eating on scones or toast – you can bake with it, replace sugar with it when making jam, trickle it over carrots or pumpkin before roasting, add it to your tea, and you can make mead with it. Mead is an alcoholic drink, similar to beer or wine, made with honey. A spiced mead is called a metheglin, and a mead made with fruit juice as well as honey and water is called melomel. The recipe below is for a simple apple and honey melomel. Start by making sure all your equipment is clean and sterilised. Miltons tablets (available from chemists) are sold for sterilising baby bottles, and are great for sterilising gear without using heat. Combine the honey and water in a saucepan, and heat until the mixture is just boiling (about 80 – 90°C). Cover and leave to cool to room temperature. Gently warm the apple juice to about 30°C (the temperature that it feels just warm if you dip a clean finger in). Stir in the yeast, and leave it to stand for 5 – 10 minutes, until foamy. Somewhere between an hour and twenty-four hours later the mead will start to bubble, as the yeast turns the sugars into alcohol. In summer in Perth you can have a sweet, fizzy mead after fermenting overnight; if you want a drier drink or the weather is colder, leave it longer. I’ve just ordered another selection of wattle seeds, to germinate and plant out. These are all varieties with edible seeds, so they’re a pretty good multi-purpose plant. The idea is to plant about half of them in our Zone 5, along with holm oaks, cork oaks, stone pines, and a variety of other semi-wild food plants and bee forage plant species – the other half will go in the pasture/woodland area as shade trees. This pasture area is going to include a series of paddocks through which our poultry and the hypothetical future goats (and maybe cow!) will be rotated. There will be fruit trees in the mix, well protected from hungry ruminants, but also a lot of multi-use fodder trees and shrubs like wattles, carob, saltbush, mulberry, and honey locust. Honey locust is an interesting one. Although it is controversial, there are indications that it’s a non-nodulating nitrogen fixer, and it certainly grows well even in nitrogen-poor soils. So well that in some areas (including agriculktural areas of Australia) it is a major weed, forming thickets that take over in pasture areas. This seems odd to me, because both the pods and the foliage are edible and highly palatable to livestock. The pods, or rather the pulp inside them, is also edible to humans, and the whole pods can be cooked and eaten as a vegetable when green. The tree is a graceful & attractive deciduous one, often planted as an ornamental. It is 20 – 30 m tall at maturity, with feathery leaves that give dappled shade in summer. It is fast growing, and can live 120 – 150 years. 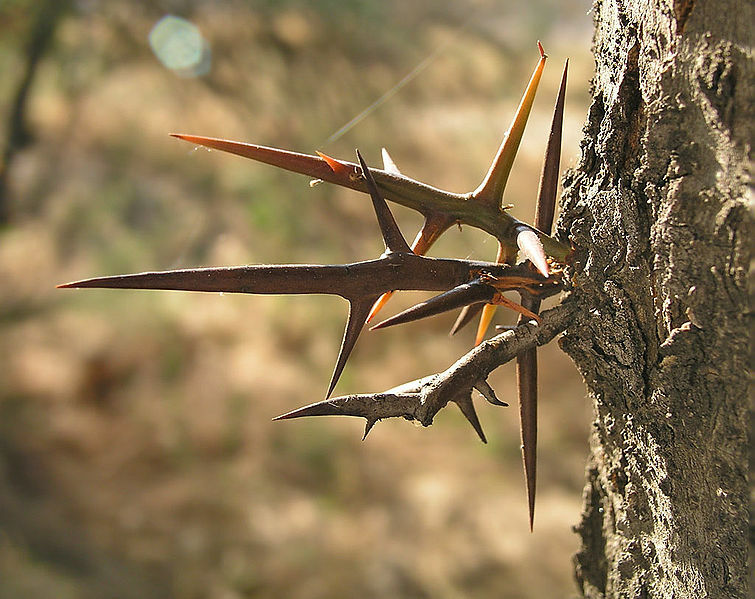 The tree is extremely thorny, with thorns growing 3 – 10 cm long on average (and sometimes as long as 20cm). Apparently the thorns were used as nails in the past. The tree and be coippiced successfully, which is often done when it is grown as a fodder plant, and produces an unusual hardwood timber used for furniture, fence posts, utility lumber, and turned objects. Honey Locust trees tend to have deep taproots and fewer lateral roots, making them well suited to agroforestry systems and alley-cropping (where trees are planted in rows, with rows of crops or pasture between them). It is also a good pioneer plant, for reclaiming damaged landscapes or areas where the soil is degraded. 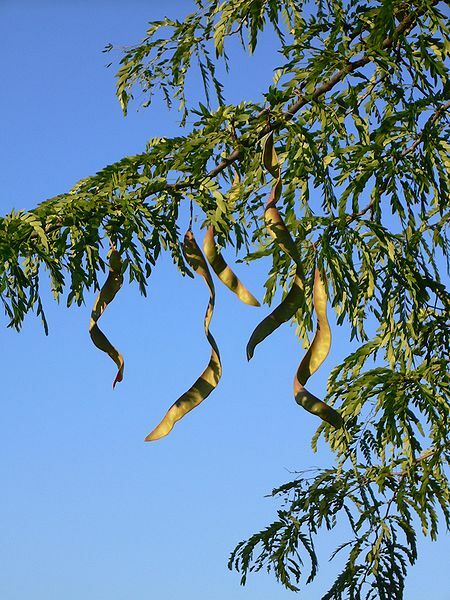 Water – Honey Locust trees are tolerant of a wide range of conditions, including extended dry periods. They occur naturally in areas where annual rainfall ranges from 510 to 1520 mm. Sunlight – Full sun preferred. 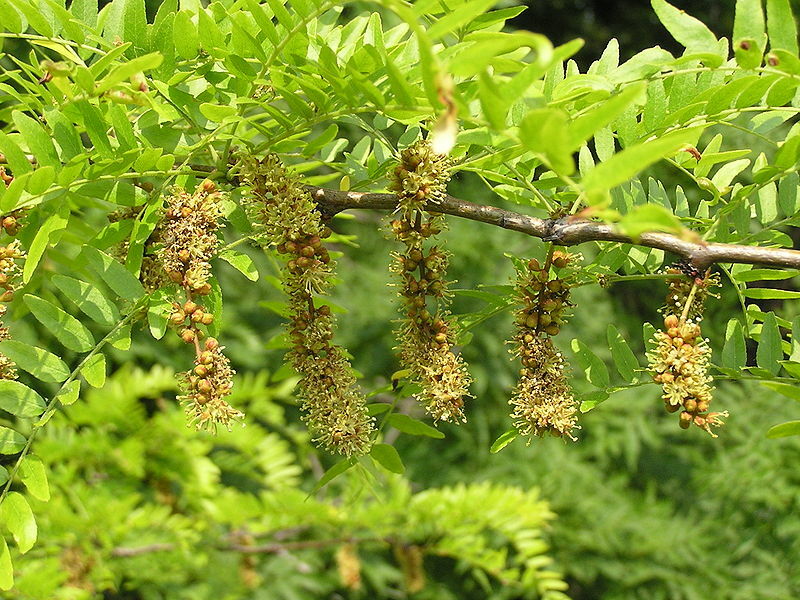 Soil – Honey Locust trees may (or may not) be nitrogen fixers. Either way, they thrive in poor soils. They grow best on soil with a pH of 6.0 to 8.0. 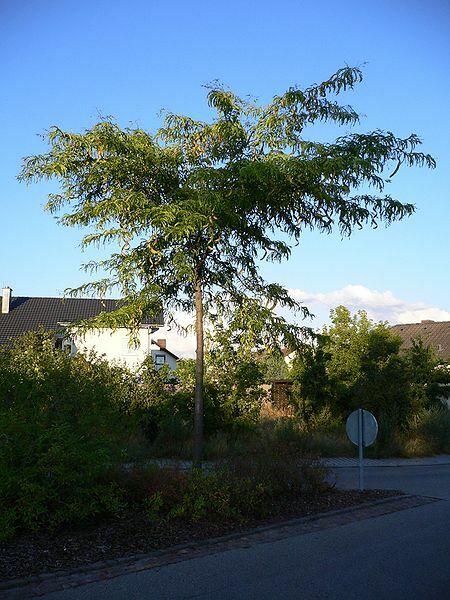 Space – For agroforestry plantings, the recommended spacing is to plant each Honey Locust in a 5 – 10 m square. Warmth – This is a very hardy plant, capable of withstanding heavy frosts and also high temperatures. Late spring frosts may damage leaves and flowers. Edible seed pods. Alcohol can be brewed from the sugary pulp inside the pods. 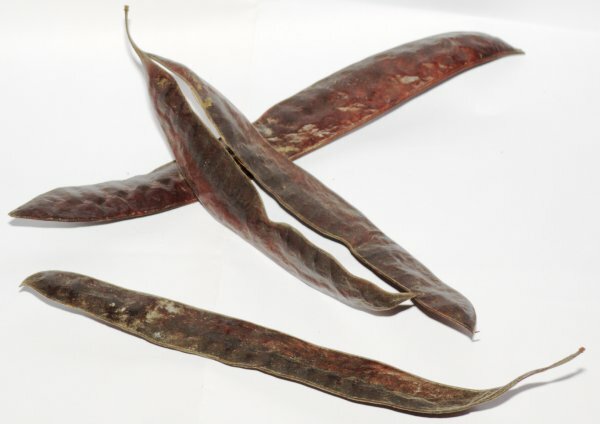 Animal fodder (seed pods and foliage). Landscape regeneration, through (possible) nitrogen fixing, shade, and erosion control. Nectar for honeybees. This is not a major nectar plant, but is visited by honeybees, and will flower reliably through the hot, dry, Perth summer. Sadly, one of our two bee hives didn’t survive. In our wisdom as new bee parents, anxious to make sure our hives were safe and comfortable, we decided that we shouldn’t open up the flower-pot hive and cut the comb out to transfer the bees to their proper home until the weather was a bit better. We got them to the property late at night, and the next day was unseasonably chilly, grey and rainy. So we left them in their flower pot, inside the plastic crate we used to transport them. The lid was open enough to allow for bee movement and ventilation, but partly shut to keep the rain out, so that it didn’t pool inside the plastic crate. And we drilled drainage holes at the bottom of the crate in case rain did get in. What we failed to consider was that a clear plastic crate is fine in cool weather, but as soon as the sun shines it turns into a miniature greenhouse. A few days later, it was too late. A few sunny mornings had heated up the inside of the crate so much that the comb inside the flower pot had melted and detached form the pot. The entire hive stank of decay, and dead bees littered the inside of the crate. We tried, in a desperate last ditch attempt to save them, to move the remaining comb and bees to a proper hive box – but we failed. By the following morning, the colony was dead. We must have missed our opportunity to save the queen and colony by only a day or so, maybe only hours. We mourned. Now we know better. 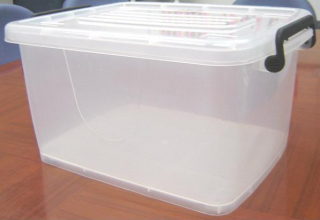 Do not leave your bees in a plastic box. In brighter news, though, the other hive is doing well. They’ve been in for almost a month now, and they seem to be thriving.